Up until recently, Microsoft Office 365 had either been bundled for large enterprises, typically covered under the Office 365 E3 plan, or available as a mix-and-match through various plans. This made it difficult for smaller agile companies to manage their cloud experience. Enterprise plans had additional features in SharePoint, Exchange, and Data security that were needed by small- and medium-sized companies but were not available in smaller bundles. Microsoft now has a cloud-based service for small businesses that combines Office 365, Data Security, and Windows 10. It’s a solution designed for growing businesses with less than 300 users that neither have the time nor the necessary resources to maintain multiple servers and seats. It also gives not only your staff but also your customers the flexibility to securely share, collaborate, and communicate seamlessly on any device, anywhere and anytime. Many young businesses punch above their weight in products or services despite their small staff. If that sounds like your company, Microsoft 365 Business really is what you’ve been looking for to move to the cloud and finally protect your data. Another growing pain for many up-and-coming companies is the fact that many employees use personal devices for company purposes. Large enterprises typically have the budget to provide laptops and cell phones, and they also have the means to deploy sophisticated tracking and control systems. But among smaller companies, employees typically rely on their own devices; thus, small businesses must develop a bring-your-own-device (BYOD) strategy to protect their data. Based on this need, Microsoft has also included device management and security in the Microsoft 365 Business offering. In this article, we’ll cover the main differences between Microsoft 365 Business and the E3 plan and take a look at whether this new solution is right for you. Microsoft 365 Business combines Office 365 apps such as Word, Excel, Planner, Teams, and more with services for remote device and mobile application management, as well as the use of Windows 10 Pro to protect devices against spam and malware. The complete Office Suite. 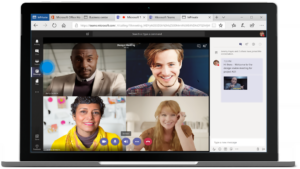 All the familiar and powerful O365 collaborating and communication tools—Word, Excel, PowerPoint, Outlook, Teams, SharePoint, Skype and much more. External sharing with clients and customers using SharePoint, Teams, or OneDrive. 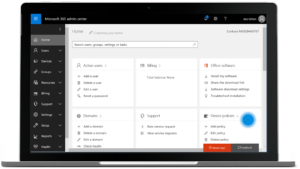 This is by far one of the best things about Microsoft 365 Business: the Microsoft Admin Console gives you a single, convenient place for administrative tasks. Here, you can configure security policies and manage devices and apps. The security settings setup consists of just 15 user-friendly menus instead of the 45 in the E3 Plan. There, you can manage company file access by implementing PIN numbers or fingerprints, prevent company content from being copied into personal apps, and use Windows Defender antivirus to automatically protect and update every Windows 10 device in your company. Dave is the owner and founder of a successful coffee roasting business. He has four retail locations plus a roasting facility that not only supplies coffee to these locations but also serves as the hub of his expanding monthly subscription and distribution center for other local restaurants. Like many small-business owners, Dave has grown from running everything by himself from just his phone and laptop to having a staff of 125 people. Dave now has all the needs of a large corporation: communication, collaboration, data security, and much more. But he does not have a support staff that focuses on running his business. Fortunately, with Microsoft Business 365, Dave won’t need a dedicated team to run his company’s IT because he gets a cost-effective offering with streamlined administrative and security features. The E3 plan is for large organizations with more than 300 users that have greater compliance, security, and IT requirements. These IT departments administer and manage everything from issuing devices and single sign-on access/authorization to advanced configurations for remote/virtual desktops and hybrid cloud deployments. Legal Hold protects and archives information (company email and data) that might be considered evidence in the event that you face a lawsuit. eDiscovery is the search and identifying of those electronic files and information that are needed for lawsuits. Advanced Threat Protection enables anti-phishing measures, safe links (wrapped in a Microsoft URL and scanned when clicked), and safe attachments (sent to a sandbox before delivery). Intune is an app built for device management. It’s what you use to perform remote wipes of company data and factory resets for Windows 10 devices. How Much Is Microsoft 365 Business? Microsoft 365 Business costs $20/month per seat or user. Microsoft 365 Business subscriptions are available for purchase through a Microsoft Partner such as SherWeb. All businesses share common needs: increasing productivity, working more efficiently, and safeguarding their data. Before, small businesses needed to wait until they could afford the enterprise features they needed. That’s no longer the case with Microsoft Business 365—now, you can take advantage of many features previously only available to corporate customers. Got questions or want to learn more about Microsoft 365 Business? Get in touch so we can help you decide whether this solution is right for your business.